Hello and welcome to all our new readers and subscribers! 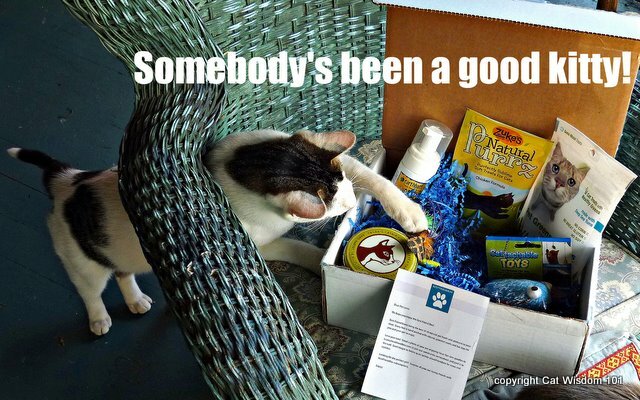 The secret is out:we often have the same great giveaways as some of the big cat websites but the odds of winning are far greater here and we’re small enough to connect with our readers purrsonally. As always, we’re here to enlighten and entertain you! Congratulations to Anna Grupke and JJ! You are the winners of last week’s Fancy Feast Giveaway. Look for an email from Layla. Odin has never met a box he didn’t like. There we were sitting on the porch when the UPS truck pulled up. Someone got a little excited from the smell of ‘nip and the sound of crinkle paper. Odin went crazy for a catnip toy dragonfly from GoCatGo and I was impressed with the selection and quality. Know a kitty that deserves some pampering? 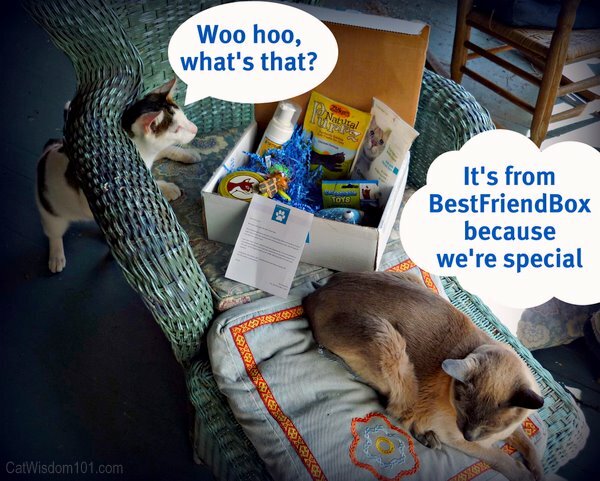 Enter to win a premium BestfriendBox for your feline best friend. Simply leave a comment at this post anytime until 11:59pm ET April 24, 2012. Please include a valid email address. For extra chances to win, please social media share on Facebook, Twitter etc. Subscribers to Cat Wisdom 101 get one extra chance to win. The winner will be chosen at random and announced next Wednesday, April 25. Good luck! 10% of all proceeds are donated to cats and dogs in need. They support local shelters, foundations, and other animal charity groups. this weblog is actually remarkable. y6jqcjgtn, 3319 pheromones psychology definition [url=http://usepheromones.webs.com/]pheromonoes[/url] pheromonoes 802 pheromones uk [url=http://pheromone101.webs.com/]pheromones yeast[/url] pheromones for cats [url=http://buypheromones.webs.com/]pheromones kuwait[/url]. BestFriendBox is a nice assortment for kitty and = super kewl giveaway. My cat would love to win these goodies! My kitties and foster kitty would love to get their paws on one of these boxes! WOW Miss Layla! Count me in for the Best Friend Box! Sure would be fun to explore everything inside that box AND the EMPTY box too!!! Wheeeeeee! Any and all cats would love this gift box. What a pleasant surprise to have this appear in the mail, like Christmas for kitties. Great giveaway! 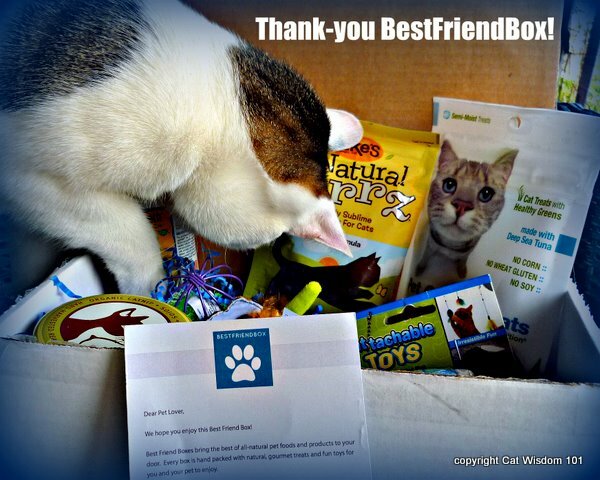 I know my cats would be happy to get a BestFriendBox! Please enter us into your contest! & we’ve just subscribed to your emails, thanks! ooh, our kitties would love this, and we think they would share! Our 2 cats would love to receive their very own box! This is such a novel idea. My cat would LOOOOOOVE this! Thanks for the chance! With 4 house kitties this would be great! I’d love to win for my cat…Cocoa! I subscribe to your site via email! I’d love to win this for my best friend, Koli! This looks like a really fun box. What neat stuff. Any cat would be pleased to get it. These boxes are a great idea! I love that they give money to shelter animals. My Foster Kitties would love this!!! My foster kitties would go crazy over this stuff!!! My three will think it’s Christmas in April! My Daisy is such a good kitty, she deserves lots of pampering! I would like to keep something for my grown up kindle and give the rest to a rescue or shelter, thanks! Hey there! This is my first comment here so I just wanted to give a quick shout out and tell you I really enjoy reading through your posts. Can you recommend any other blogs/websites/forums that deal with the same topics? Thank you so much! Congrats to Anna Grupke and JJ!!! This is yet another prize that any kitty would luv to win. We sure would! My cats would love this!! Thanks! I can imagine that my cats would love everything from what’s inside the box to the box itself. What a cool box of goodies! Please enter us! I would love to be entered in the giveaway please. One can never have too many goodies! WOW! That’s awesome! My Hutch would flip out! 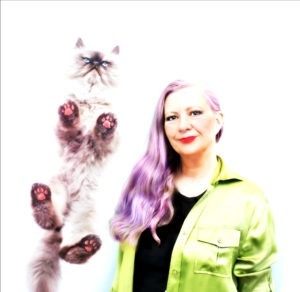 Congrats to the winner of those fabulous PURRizes! Also, I wanted to let you know that you are on the LOLSpot today. I did an entire feature on your kitties. Take a look and let me know what you think! I hope you are aMEWSed. Thanks Wendy! I’d like to feature this on with a link for our Friday Funnies. My Ellie would love this box! I will be checking out this service because I have niece and nephew cats! 🙂 It is a great idea! WeeeeeeeOooooo, that is one cool giveaway! please don’t enter us because Cody has soooooooooooo much “stuff” but this is a GREAT give-away! I am a subscriber also! What a fabulous give a way!! Ps : I’m not sure it limited for only U.S.A or not, if not and if I win, please contact me this email. mrpuddy9@gmail.com cause mom’s email, we are not checking anymore. i thought it was such a great idea that i posted the link for ‘the world’s greatest cathouse’ followers on facebook. Ooohhhh, those boxes look like great fun for everyone!! !